To mark what would have been Julia Child’s 104th birthday on August 15, curator Paula Johnson shares new information on two works of art in Julia’s kitchen. To keep up with all the latest Food History information and programs, including our Julia Child themed Cooking Up History demonstration on August 12, join our Food History email list! The bluefish print hanging in Julia’s home in Cambridge, Massachusetts, before the kitchen was collected by the Smithsonian in 2001. “I made the print of the bluefish on the day when Julia caught it off our Herreshoff 12-1/2 foot sailboat while sailing in Saco Bay near Prouts Neck [Maine]. Julia and I were with my husband, Herbert Pratt, at the tiller. It was the morning of August 31, 1975. Julia and I were fishing for mackerel with the usual small-hooked, multicolored mackerel rigs, holding the lines by hand over the sides of the gunwales. Suddenly Julia yelped that she had a huge bite. With considerable pulling she got what we thought would be multiple mackerel wiggling on the line. Instead, to our amazement, it was a big fish. When we got it into the cockpit and onto the deck, we realized it was a bluefish—the first one we had ever caught, or seen, in Maine. We were all astounded. “Julia said with glee that she had been eager to cook a whole fish in a new way. We went ashore and showed it to Paul [Julia’s husband]. I had been making fish prints in the Japanese manner that summer, using my regular Winsor and Newton watercolors, so I had all the equipment to make one [fish print] of the bluefish. I cleaned and dried the exterior of the fish and laid it on a flat surface. I covered it with Payne’s Grey [paint color] using my 2” flat brush. Then I placed a sheet of rice paper over the fish and carefully rubbed it to get all the details of the fish including the fins and tail. I carefully lifted the paper off to have a nice clean image of the fish. “While Julia and I prepared the fish in her new way, Paul and Herbert set the table and chose the white wine for lunch. The new way was: Place the cleaned but not scaled fish on a baking sheet. Oil the fish. Bake in a 400 degree oven for about 20–25 minutes. Skin the fish and place the cooked fish on a platter to serve. “Licking our chops in delightful anticipation, we sat at the table with a wide view of the sea from which the fish came. Julia served our plates and just before taking the first bite, we raised our glasses in joy. We all took our first bite and, to our horror and dismay, the fish was tough as leather. It was basically inedible! We were utterly disappointed, as we had thought what perfection it would be to have a spanking fresh fish. We had no idea what was wrong. “At eight o’clock one morning 10 years later, Julia called me. ‘Pat, Pat,’ she said, ‘I just found out why our bluefish was so tough. I’ve just been talking to John, in Seattle, who deals with all sorts of fish big time at the fish pier. . . . He said it is very important that fish be out of rigor mortis when you cook it, otherwise it will be ‘tough as leather,’ it may be a matter of days for big fish like salmon and tuna.’ Julia was a bird dog in always wanting to find answers to questions and problems. This time, it took 10 years!" Unsure what to make of this, I consulted an article on rigor mortis in fish, which suggests that if Julia and Pat had put the fish back on ice and waited a few hours, it would have passed through rigor, at which point the muscles would have softened again and the fish would have been edible when cooked. The top of Julia’s refrigerator and Paul’s fish print. 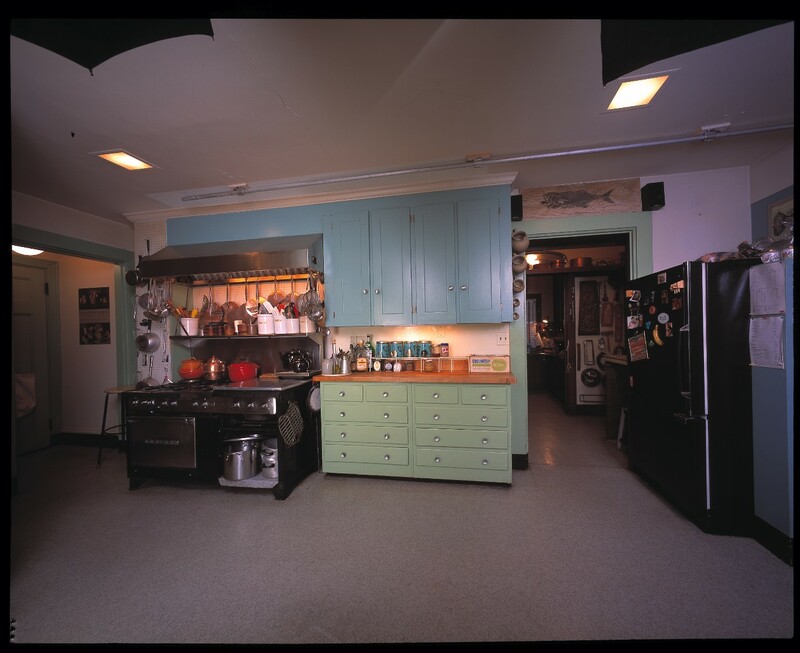 Photo from 2001, as the Smithsonian team documented Julia’s kitchen prior to collecting it. 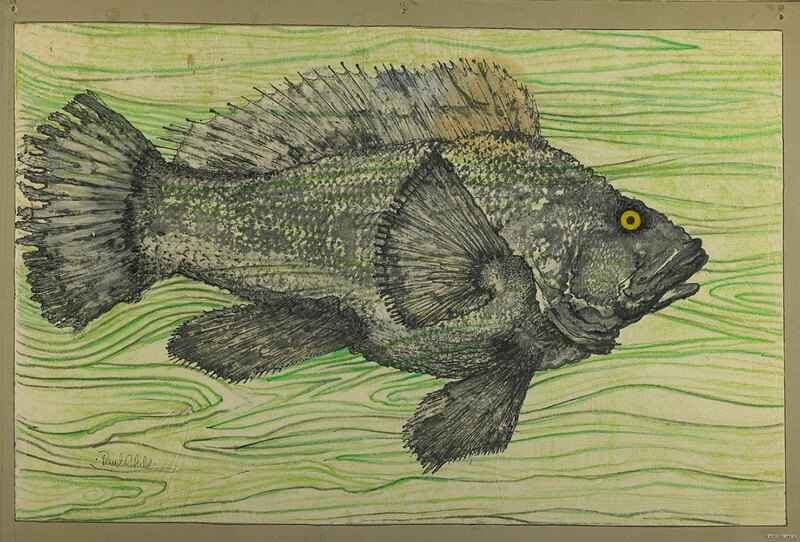 This 25.5” x 17.7” fish print is more straightforward because it is signed by Paul Child, an artist in his own right. While we do not know the exact date for Paul’s fish print, we know that he used the same techniques described by Mrs. Pratt. 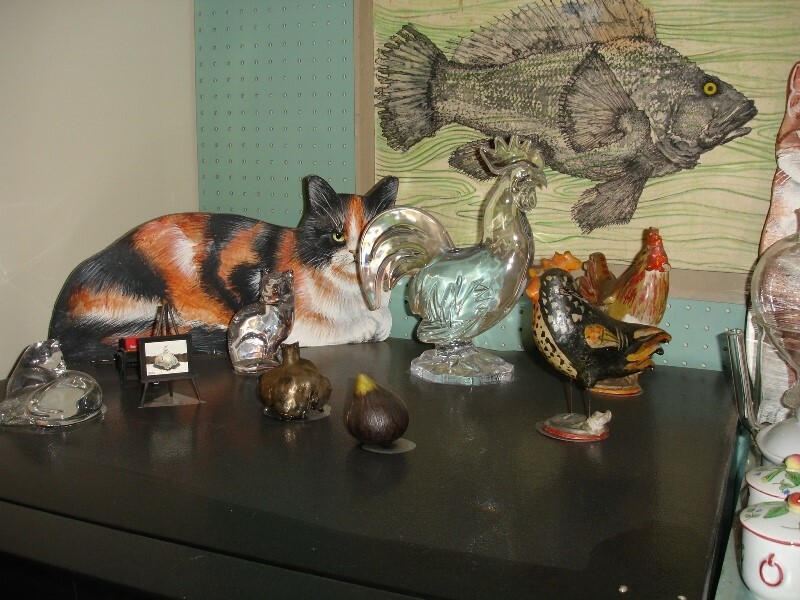 She speculates that Paul made the wavy water by hand “as he was not near our dining room table for the raised grain.” The rock cod print hangs above the refrigerator and is a bit more difficult to see; a menagerie of ceramic and wooden cats, chickens, and miscellaneous kitchenware partially obscure the view of the print. The rock cod fish print. 2001.0253.0747. 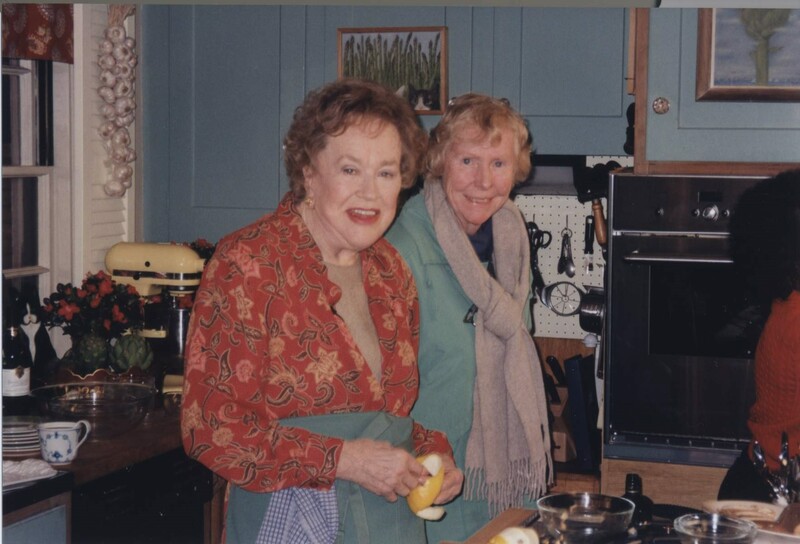 Julia Child and Pat Pratt in the kitchen in Cambridge, 1998. Photo by Christopher Hirsheimer. The lesson of the fish prints meshes with Julia’s attitude toward cooking: never stop asking questions because you might learn something new! You can read more about Julia’s kitchen and recipes on our blog! The museum is proud to preserve Julia Child’s legacy through programs exploring food history, supported in part by the Julia Child Foundation for Gastronomy and the Culinary Arts.